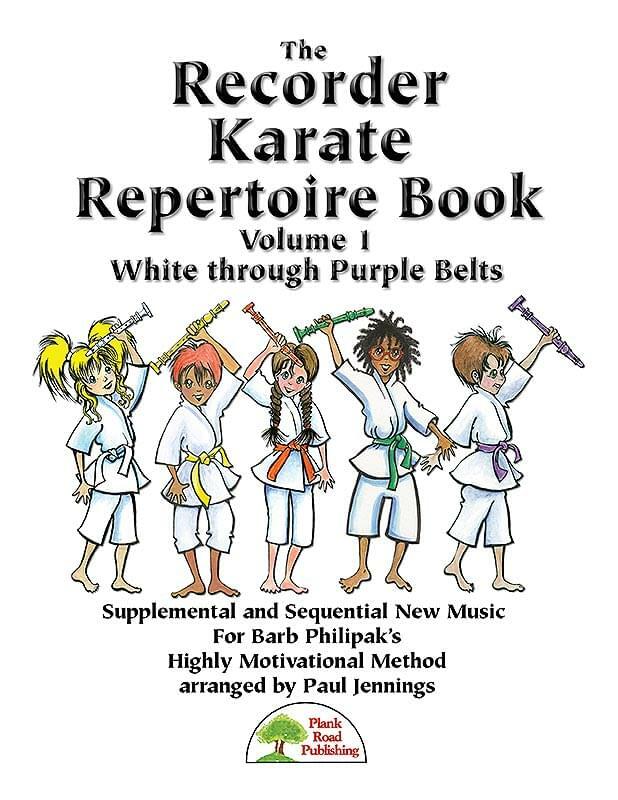 There is a good reason that Recorder Karate has become such a powerful force for recorder programs all over the world – it provides incentives for young players to keep progressing in their skills. But as with any fixed method, the music included can't be all things for all schools. For that reason, we have created the first in a series of collections that will provide carefully selected and arranged music appropriate to each belt level and for those spaces between levels where new music can fill special needs for reinforcement, for reward belts, or even for special "in-between" belts. Arranged by Paul Jennings, this array of songs is sequenced to correspond to the first five belts in the system (which feature the notes low D, low E, G, A, B) and, toward the end of the collection, to provide a bridge to the sixth belt (which introduces both high C and high D) by offering tunes that just require the addition of C to the notes previously learned. Each arrangement is designed like the selections in both Recorder Karate 1 and 2, with a short intro and a testing length. When appropriate, songs are recorded at two tempos. Some tunes also have longer versions of the song to make them usable for concerts. We have also included special bonus tunes, each within the technical parameters of these levels. Au Clair De La Lune - BAG - Concert and Test - A lush setting with strings and rich new harmonies. Down By The Station - BAG - Upbeat underpinnings and train sounds make this a great BAG tune. Kuma San (Mister Bear) - BAG - An evocative setting of a folk song popular in Japan... something really different for young players. Señor Squirrel (Hop Old Squirrel) - BAG - Concert and Test - Driving Latin big band setting of the old folk song. Good News! - BAG - Authentic setting of the old gospel chorus, with a superb recorded track to play along with. Hot Cross Kangaroos - A Rhythm Monster - BAG - A unique setting of this familiar BAG tune that is a great rhythm reading exercise. Recorded in two tempos, it also has an added vocal track featuring the cool teaching lyrics. Lucy Locket's Pet Snail "Sparky" - EGA - One length, Slow and Fast - Combines these two similar folk songs that feature the same notes into one quirky, fun-loving setting. I Am A Poor Wayfaring Stranger - EBAG - Concert and Test - A beautiful acoustic setting of this gospel folk classic. Jolly Old Saint Nicholas - DEBAG - Concert and Test - This is one crisp, happy orchestral setting of the old secular seasonal favorite. Old Brass Wagon - DEBAG - Eight tracks: Slow and Fast, Concert and Test, including just accompaniment tracks - A very cool Appalachian setting complete with a superb violin "fiddle" solo. A must have piece for any recorder curriculum. Shake Them 'Simmons Down - DEBAG - Eight tracks: Slow and Fast, Concert and Test, including just accompaniment tracks - Bluegrass style abounds in this fun-loving setting of the old children's movement and game song about the picking of persimmons. The next two songs are a bridge between Purple belt and the next level up, just adding high C, instead of high C and D.
Barcarolle - GABC - Offenbach's most famous melody is a great way to introduce high C and play in a legato style. And the student part has a portrait of the composer and important facts about his life. Dance Of The Jesters (Les Bouffons) - GABC - This old Renaissance dance from the 16th century by Thoinot Arbeau is a great introduction to this style of music and to the note high C.
B A Black Belt - BA - While Recorder Karate doesn't include a BA tune, we thought this cool, easy tune would be great to use early in your program. I Am A Poor Wayfaring Stranger (duet version) - EBAG - Similar to the earlier arrangement, but now with a nice, echoing second part. A great introduction to duet performance. Entrance Of The Dragon Riders - BAG, EBAG - This powerful work from RECORDER CLASSROOM is a great playing experience for young students, using just the BAG first part, or the slightly more difficult part using EBAG. And an easy alto recorder part is supplied as it was in the original publication. Adding to your cart will take you to MusicK8.com for checkout.